Tenn and Tenn, P.A. 's motorcycle accident attorneys encourage you to read this overview of motorcycle safety regulations and suggestions before you climb on the back of a bike. It is important to be familiar with your legal rights. It is just as important that you know how to keep yourself, and your passengers, safe while out enjoying New Hampshire's inviting roadways. As of this writing, New Hampshire remains one of only three states in America that does not require motorcycle riders to wear a helmet. While the benefits of enacting such laws versus utilizing rider education programs to protect people are often debated, there are many well-respected medical studies and government statistics regarding the protection offered by motorcycle helmets that you shouldn't ignore. These studies of the proper use of motorcycle helmets consistently demonstrate that helmets reduce the risk of brain injury and death following a crash. One study conducted in 2008 showed that higher quality helmets significantly reduced the risk of death by 42 percent and the risk of head injury in general by 69 percent. Anyone who rides a motorcycle knows that the most important piece of protective gear is a DOT certified helmet. This fact was made abundantly clear in the Hurt Report from the University of Southern California (USC) researcher Harry Hurt. "Motorcycle Accident Cause Factors and Identification of Countermeasures.” This research provides clear documentation that helmets save lives by reducing head injuries. Let's look at what a helmet really does for you. First, it is the best protective gear you can wear while riding a motorcycle. Think of it at the same time you think of your ignition key. You pick up the key, you pick up the helmet. They go together. Helmet use is not a "cure-all" for motorcycle safety, but in a crash a helmet can help protect your brain, your face, and your life. In combination with other protective gear, rider education courses, proper licensing, and public awareness, helmet use is one way of reducing risk of injury. You hope you never have to use your helmet, just like you hope you won't ever need to use the seat belt in your car. But accidents do happen. We can't predict when or what kind they will be. In any given year, a lot of people make good use of seat belts, and a lot of riders give thanks that they were wearing helmets. Second, a good helmet makes riding a motorcycle more fun. This is the comfort factor. It cuts down on wind noise roaring by your ears, on wind blasts in your face and eyes, and deflects bugs and other objects that fly through the air. And helmets keep you comfortable when the weather changes, especially when the rain starts to fall. Finally, anyone who has taken a long motorcycle trip knows that helmets help reduce rider fatigue. Third, wearing a stylistic motorcycle helmet adds to your image. Motorcycle helmets aren’t just for race tracks -- responsible riders who take motorcycling seriously know the true benefits of a helmet. Wearing a helmet, no matter what the law says, is a reflection of your attitude toward riding and that attitude is plain to see by other riders and non-riders alike. To ride a motorcycle means avoiding foolish risks. Different helmets do different things. There are construction hard hats on construction workers’ heads, football helmets on athletes' heads, and Kevlar pots on military heads. None are interchangeable. Motorcycle helmets are very sophisticated and specialized for the activity. They've been developed carefully and scientifically over the years. Four basic components of the helmet work in unison to provide protection: an outer shell, an impact-absorbing liner, comfort interior padding, and a good strap or retention system. 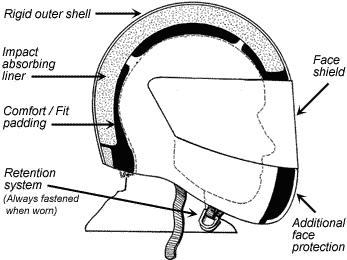 The outer shell of the helmet is typically constructed of reinforced composites or thermoplastics like polycarbonate. These are strong materials, but they are designed to crunch upon impact with a hard surface. That crunch-action disperses energy from the impact in order to reduce the force of the blow before it reaches your head. Inside the helmet shell is an impact-absorbing liner, usually made of expanded polystyrene (commonly thought of as Styrofoam). This dense layer is designed to cushion and absorbs the shock of the impact. In other words, as the helmet stops the sudden impact, your head inside keeps on moving and the cushion is there to absorb the impact. Working together in the event of a crash or sudden blow, the outer shell and the inside liner essentially self-destruct, by dissipating the harmful forces of impact throughout the helmet. Simply put, the more negative impact energy deflected or absorbed by the helmet, the less there is to cause damage to you. Some helmet shells will delaminate upon impact. Others are designed crack or break apart if severely impacted. A cracked helmet may not be a sign of a defective helmet, but rather an indication that it did its job. The comfort padding is the soft-foam-and-cloth layer that sits next to your head. It helps keep you comfortable and the helmet fitting snugly. In some helmets, this padding can even be taken out for cleaning. The retention system, or chin strap, is very important. It is the one piece that keeps the helmet on your head in the event of a crash. A strap is connected to each side of the shell. Every time you put the helmet on, do up the straps securely. It only takes a couple of seconds. To ride without the helmet securely strapped on would be as questionable as driving without your seat belt fastened. While color, design and price may be a part of your decision about which helmet to buy, think first about protection. A full-face helmet gives the most protection since it covers more of your face. It usually has movable face shields protecting the eyes and is easily operated with one hand. Professional and seasoned riders tend to prefer full-face helmets for the added protection and comfort. A three-quarter, open-face helmet is also a choice of some riders. It is constructed with the same basic components, but doesn't offer the face and chin protection of full-face helmets. If you use an open-face helmet, you should have a snap-on face shield in place when you ride, or buy a pair of goggles that can withstand the impact of a stone. 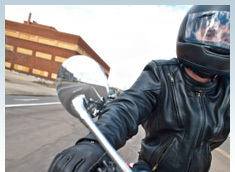 Ordinary glasses or sunglasses are not sufficient eye protection for a motorcyclist, and they might move or fly off. A half-shell helmet protects even less of your head. It is more likely to come off your head upon impact. Therefore, half-shell helmets are not recommended. A lot of good helmets are available today, in all price ranges. Most bike shops have dozens of helmets to choose from and in just about every color, decoration and design you could imagine. The days of heavy or cumbersome helmets are no more. They're made of light new materials and keep improving every year. The manufacturers are also working to make them less expensive, stronger, and more comfortable. Impact: the shock-absorbing capacity of the helmet. Penetration: the helmet's ability to withstand a blow from a sharp object. Retention: the chin strap's ability to stay fastened without breaking or stretching. Since 1980, ALL adult-sized helmets for on-highway use must meet D.O.T standards. Helmet dealers and distributors must ensure that all the helmets they sell bear the D.O.T sticker. Whatever your helmet choice, be sure it has this certification. You don't want an inferior helmet or one designed for another purpose. If someone tries to sell you one without it, don't buy it. If you have one without it, the helmet is probably so old it should be replaced anyway. Snell has been testing helmets since the 1950’s. The use of Snell standards by helmet manufacturers is voluntary, unlike D.O.T standards. Snell testing is of high quality and is revised as helmet design and technology improve. Both agencies attempt to reproduce under test conditions, the situations that are hazardous to motorcyclists. And, although they both have different methods of testing helmets, the intent is to produce life-saving, shock-absorbing minimum requirements. As the Hurt Study made clear, head injuries cause the majority of motorcycle fatalities. As such, good head protection is vital for every motorcyclist. Unfortunately, even the best designed helmet cannot prevent against a head injury. Statistically, if you are involved in a crash and are not wearing a helmet, you are five times more likely to sustain a serious head injury, than a rider wearing a helmet. There's more to fitting a helmet than just buying one that matches your hat size or guessing at "small, medium or large." Your hat size is a good starting point, however. If you don't know your hat size, measure your head at its largest circumference - usually just above your eyebrows in front, over your ears and around in back. Try it several times so you know you've gotten the largest number. Don’t judge by the size market on the helmet—try it on to ensure a proper fit! Until you have done it a few times, it’s a little awkward. Grab the helmet so the bottom of the helmet is facing toward you and the front is pointing down. Put your thumbs on the inside of the straps, spread the sides of the helmet apart slightly and guide it down over your head. That’s it. The helmet should fit snug and may feel a bit too tight until it is properly in place. Be sure it sits squarely on your head. Remember, if your helmet is too large it will wiggle around and move up and down. An improperly fitting helmet will let noise and wind in and may even come off in an accident. That’s not what you want. 1. The cheek pads should touch your cheeks without pressing uncomfortably. 2. There should be no gaps between your temples and the brow pads. 3. If the helmet has a neck roll, it shouldn't push the helmet away from the back of your neck. 4. On full-coverage helmets, press on the chin piece. The helmet or face shield should not touch your nose or chin. If it does, it will surely do so at speed from wind pressure. With the helmet still on and the straps securely fastened, move it from side to side and up and down with your hands. If it fits right, your scalp should move as the helmet is moved. You should feel as if a slight, even pressure is being exerted all over your head by the helmet. Remember too that a helmet loosens up a bit as the comfort liner compresses through use. So a new helmet should be as tight as you can comfortably wear it. Take off the helmet. Does your head feel sore anywhere? Are there any red spots on your forehead or on your cheeks? Pressure points can be uncomfortable and can cause a headache after a long ride, so be sure your helmet isn't causing any. If it is, choose the next largest size or try a different brand of helmet. Human heads are not all the same shape; neither are helmets. If you are still unsure about the helmet's fit, wear it around the store for awhile to see if it remains comfortable. A helmet is an important investment, no matter what its price. Be sure the one you choose is right for you. Follow the manufacturer's directions on caring for your helmet. Use only the mildest soap recommended. Avoid any petroleum-based cleaning fluids, especially if you own a polycarbonate helmet. Exposure to strong cleaning agents can cause the helmet to decompose and lose protective value. Keep your helmet's face shield clean. Normally, mild soap and water with a soft cloth will do the job. If it gets scratched, replace it. A scratched face shield can be annoying to look through. At night, it could dangerously distort your vision and the appearance of oncoming lights. A helmet looks tough and sturdy, but should be handled as a fragile item. This means that you don't want to drop your helmet onto hard surfaces. It could ruin your helmet. Remember that its function is to absorb impact in an accident. Definitely read the instructions about painting, decorating, pin striping, or applying decals to your helmet. Some outer shells can be adversely affected by applying paint or stickers. Be certain to take good care of the inside of your helmet as well. Hanging on a hook, side mirror or sissy bar can cause damage to the inner lining. In fact, avoid carrying a spare helmet on your cycle, unless it's well protected or on your passenger's head. Even the bumps and jarring from normal riding can damage a spare helmet. If it is strapped on near hot engine parts or exhaust pipes, the inner liner may distort or melt at the hot spot. The outer shell may not show the damage, but if you've ever seen the effects of a Styrofoam cup placed near excessive heat, you can understand what happens. When you take your helmet off, find a secure, flat place for it. That might mean setting it on the ground, securing it on a rack, or stowing it on a shelf. On some bikes, putting it on the gas tank may expose it to gas fumes. If you place it on the seat, make certain it can't roll off. If you plan to use a radio or intercom when you ride, find a model that doesn't require drilling speaker holes in your helmet's structure. Before you purchase your speakers, check your state's laws. Some states prohibit helmet speakers. Plan to replace your helmet if it is involved in a New Hampshire motorcycle crash; it probably absorbed some impact shock. Some helmet manufacturers will inspect and, when possible, repair a damaged helmet. If you drop your helmet and think it might be damaged, take advantage of this service. Why replace a helmet every few years if it doesn't appear damaged? Its protective qualities may deteriorate with time and wear. The chin strap may fray or loosen at its attaching points or the shell could be chipped or banged. Probably the best reason, however, is that helmets keep improving in quality. Chances are that the helmet you buy in a couple of years will be better, stronger, lighter, and more comfortable than the one you own now. It might even cost less! Can't remember when you bought your present helmet? Check the chin strap or permanent labeling. Since 1974, all helmets must have the month and date of production stamped on it. If there's no date at all, you should definitely replace your helmet now! Reflectivity Many states require a specific amount of reflectivity material on a helmet. Check with your dealer to be sure the helmet you plan to purchase meets the requirements. Ask if it will be damaged if you do apply reflective tapes or decals to it. Again, read the manufacturer's information. Your local motor-vehicle department can give you exact information on the location and number of square inches of reflectivity material required in your state. Helmet Laws Wearing a helmet properly strapped on your head is mandatory in many states. Laws are always changing, so double check with the state motor vehicle department for the most current information. Planning on a tour through several states? State laws apply to travelers as well as state residents. Don't leave home without the information you need. Better yet, don't leave home without wearing your helmet. Getting More Information There are many things to consider when buying a helmet. Get ALL the information you can. Talk with an MSF-certified Motorcycle RiderCourse® Instructor, your local motorcycle dealer, and other riders. Contact helmet manufacturers and read their literature. Consult recent motorcycle-enthusiast magazines for up-to-date information to help in your decision. Take the safety courses required to get a motorcycle license and refresher courses as needed. Wear gear such as a heavy-leather jacket and leather pants to protect your body. Know your limits – don't ride at speeds in excess of your ability to control your bike. Don't travel off-road or on other uneven surfaces until you've learned how to handle the bike under these conditions. Make sure you and your bike are visible to other drivers, especially at night by utilizing lights and reflectors. Check your motorcycle before you go out for a ride to ensure it is functioning properly. Take your bike in for regular maintenance. Avoid riding in poor weather conditions like rain, snow or ice. Unfortunately, you can follow all the sensible rules for safe motorcycle riding and still wind up the victim of an accident. Automobile and truck drivers can be careless when it comes to passing you on the road, checking their blind spots before changing lanes and otherwise making moves that endanger you and your passenger. If the worst happens, and you suffer injuries due to a motorcycle crash, you should contact a New Hampshire personal injury law firm like Tenn and Tenn, P.A. We have the experience to assist you with any legal action necessary. Page reprinted in part from the Motorcycle Safety Foundation.